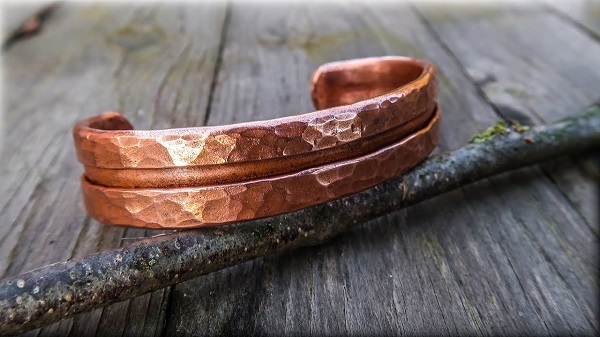 Isn't this copper bangle lovely? It was made from a copper pipe by DIYer Black Beard Project. A quick demonstration on some basic metal work techniques using just a hammer, vise and torch. Here is what he said about the project : "Copper is a very soft metal that, if annealed, it can be bent into shape quiet easily even cold. It is also very easy to anneal just by heating it up with a blowtoch, and can also be quenched in water still hot because it does not harden by quenching. But still, it will hardens after you shape it for a while (work hardening) so just anneal every time it stiffens up and gets hard to bend." He doesn't mention it but he also cleans the copper after torching by dipping it into a dilute acid solution (pickle). The fold forming technique was pioneered by Charles Lewton- Brain. Please check the links below which includes another fold formed design tutorial. Copper pipe is a budget friendly way of getting hold of a good chunk of metal. A little bit of work and that copper pipe becomes a piece of jewelry! A section of pipe can be cut using a tube or pipe cutter. These tools are used by plumbers. Very easy to use. Really. Watch this basic tutorial by AdamDIY on how to use one. This small tube cutter is typically used in tight spaces. I sure love working with copper!